Flex Foam Finger Pockets, available in three different grade foams for different uses, are manufactured using an open cell foam and brings your applicator right to your fingertips – literally! 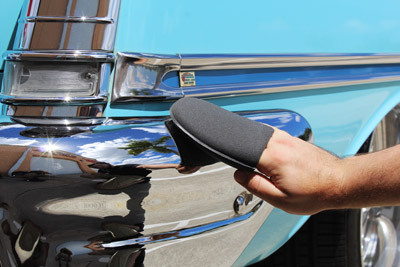 Perfect for those hard to reach areas, Flex Foam Finger Pockets can be used on all surfaces, interior and exterior, to ensure every inch of your car, truck, or SUV, is polished and waxed to perfection! When cleaning intricate wheel patterns, motorcycle components, or tight space on your paint, most people resort to wrapping two or three fingers in a towel to reach into narrow spaces. Towels really aren’t thick enough to offer your fingers any protection and they can slip off your hand. Flex Foam Finger Pockets are soft, dense foam pockets that fit over your fingers for easy and efficient cleaning. One pocket fits snugly over three or four fingers, depending on how large your hand is. You get the maneuverability of using your own hand as a cleaning tool along with the polishing capability of quality foam. Plus, your fingers are cushioned against potentially sharp edges while you work. Yellow Aggressive Flex Foam Finger Pocket – Manufactured with an aggressive grade, open- cell foam, the Yellow Aggressive Flex Foam Finger Pockets are perfect for use on heavily soiled wheels, engine bays, undercarriages, and other surfaces that need a heavy cleaning. Use Yellow Aggressive Flex Foam Finger Pockets with an all-purpose cleaner or degreaser for a quick and effective cleaning step! 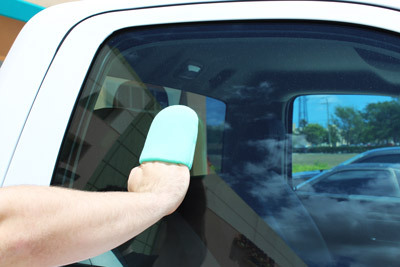 Green Medium Flex Foam Finger Pocket – The Green Medium Flex Foam Finger Pocket is paint-safe and can be used to polish wheels, hard-to-reach areas on your paint, and interior surfaces. Apply wheel and tire glazes, glass polishes, and trim and tire cleaners and protectants with the Green Medium Flex Foam Finger Pockets.